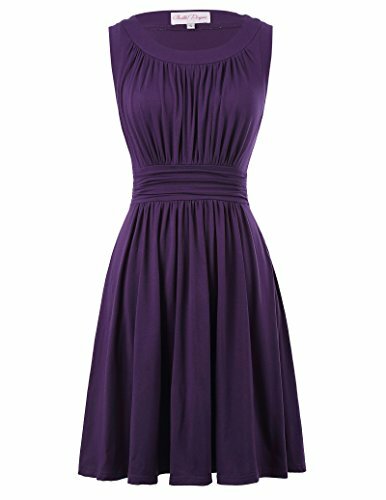 The sleeveless a-line dress can be used as bridesmaid dress, wedding party dress, prom dress，evening dress, birthday party dress, wedding guest dress, formal party dress, homecoming dress, or cocktail dress. What a nice dress! This sleeveless vintage retro dress with crew-neck is high stretchy and made of cotton and spandex fabric that friendly to your body and bring you comfortable feeling. The pleated and a-line hemline design let you look elegant and stick out from the crowd. You deserve it! Products that are sold by other sellers in this page are imitation products similar in design. Please keep in mind, these unauthentic dresses does not have same quality such as color, fabric, construction and over all design and feel as our products. & The real color of the item may be fairly different from the pictures shown on website caused by many factors such as brightness of your monitor and light brightness. & Hand wash. Please don’t soak the dress in water for a very long time, in a different way the dye will fade(Of course,dye would possibly not fade under normal washing). & Any questions or problems to our products or service, please email us freely, we can reply and solve it for you ASAP. 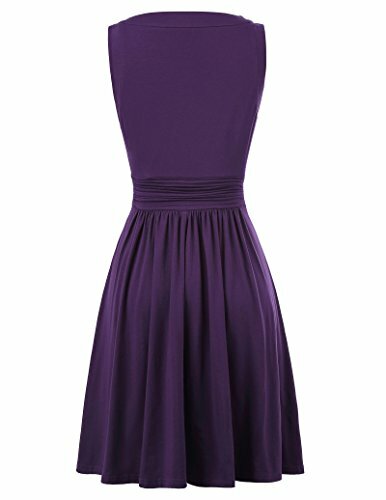 The sleeveless a-line dress can be utilized as bridesmaid dress, wedding party dress, prom dress，evening dress, birthday party dress, wedding guest dress, formal party dress, homecoming dress, or cocktail dress.